They are the Urban Picassos; the James Deans in the coffee shops; the bass-guitarists in the hot beverage band. 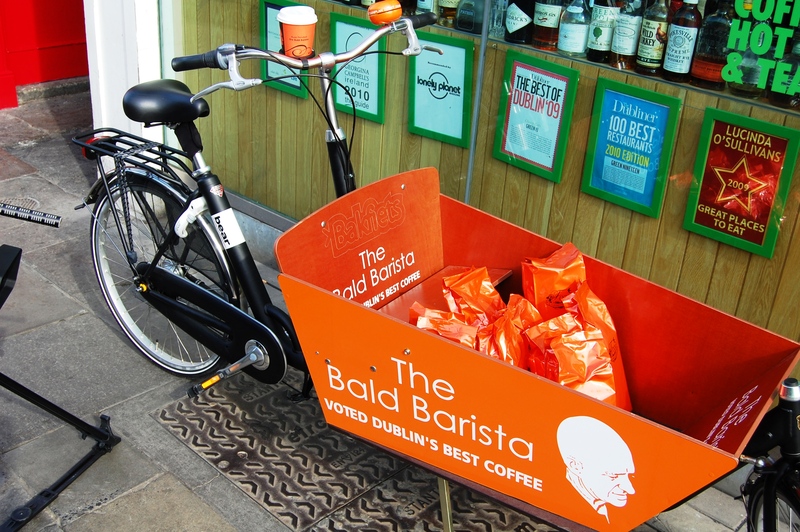 And in Dublin, there is one undoubted leader; one Bob Ross (without hair) Dublin’s coffee junkies turn to – for truth, trade and taste: Bald Buzz Fendall – the Barista to rule them all. 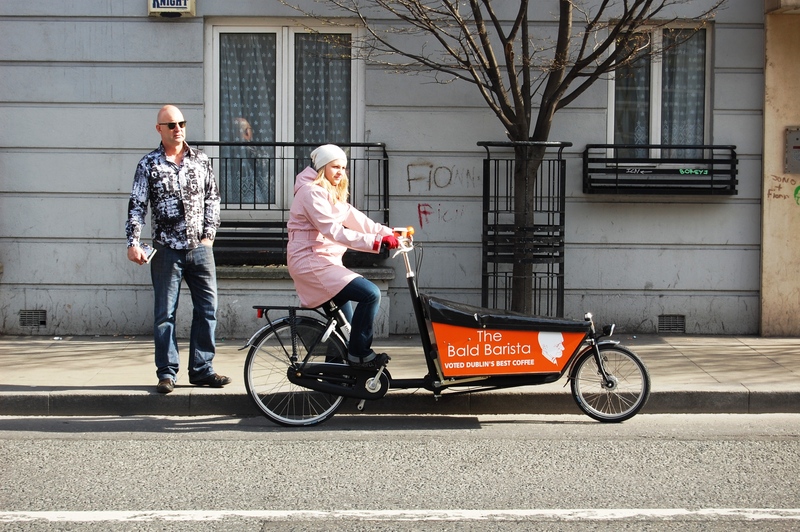 And since recently, that Bald Barista owns a delivery bike. Francois de Poortere, Old Masters Specialist for Sotheby’s, has lived – and cycled – in Paris and London, Europe’s capitals of style and architecture. However, the Belgian born Francois prefers his current home New York – for its style, its architecture, and its cycling. It’s here, when he’s cycling to work in the morning, with the rising sun’s rays reflected by the glass walls of Manhattan’s East Side skyscrapers, Francois feels truly at home. 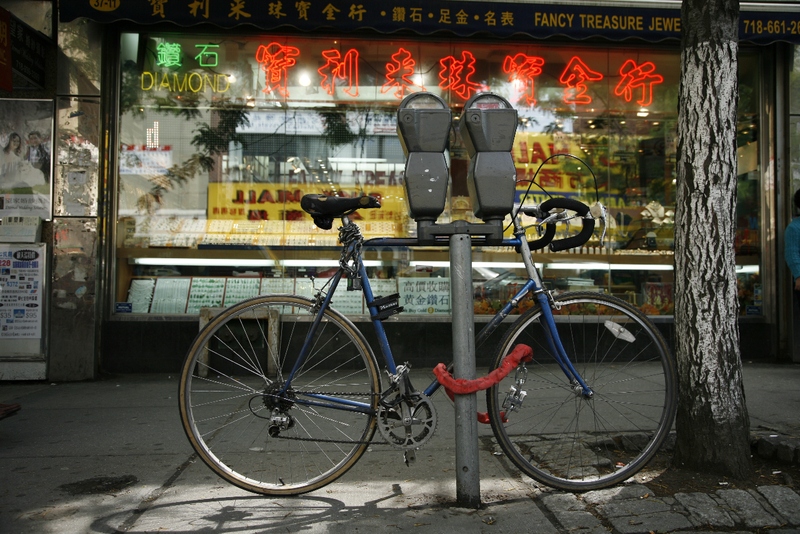 Francois lives in Williamsburg – a Brooklyn neighbourhood with organic markets, latte artists, and cyclists. On a typical workday, Francois gets up at 7.45 a.m. He likes to take time starting the day, and considers himself lucky his newborn son Carlo is a good sleeper. As Francois puts on cycling gear, his wife Sunny uses the juicer to turn fresh apples and ginger into a drink for herself and her husband. After the juice and a banana, Francois is on his way to work. Unlike commutes from other Brooklyn residents, his does not involve subways or tunnels and is unaffected by any traffic jams; Francois knows he will be in the office precisely 22 minutes after he starts cycling. Francois leaves his house on Guersney Street, located on the edge of Williamsburg. He heads north and soon crosses Pulaski Bridge. On that bridge, he looks out over Newton Creek; its water marking the border between the boroughs of Queens and Brooklyn. 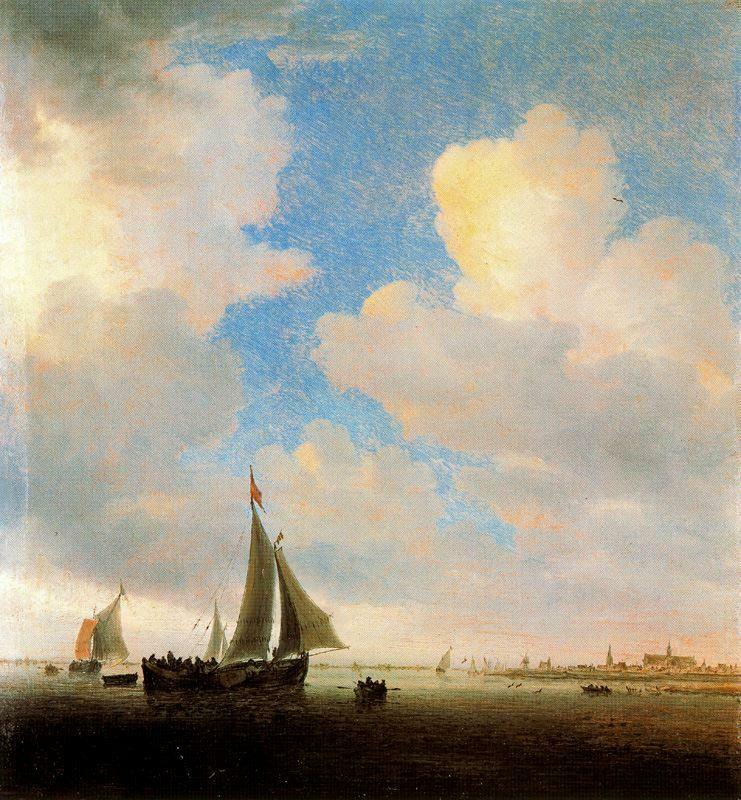 The creek ends in the East River, where on sunny mornings with cloud swept skies Francois will see ships sailing, reminding the Old Masters Specialist of paintings Jacob van Ruijsdael made of the Dutch seas, more than 400 years ago. A few blocks north, after cycling through empty streets and past warehouses, Francois turns left onto Queensboro Bridge, taking him out of Queens and onto Manhattan Island. Queensboro Bridge has a separate cycling lane, and Francois is joined by other cyclists commuting into Manhattan. 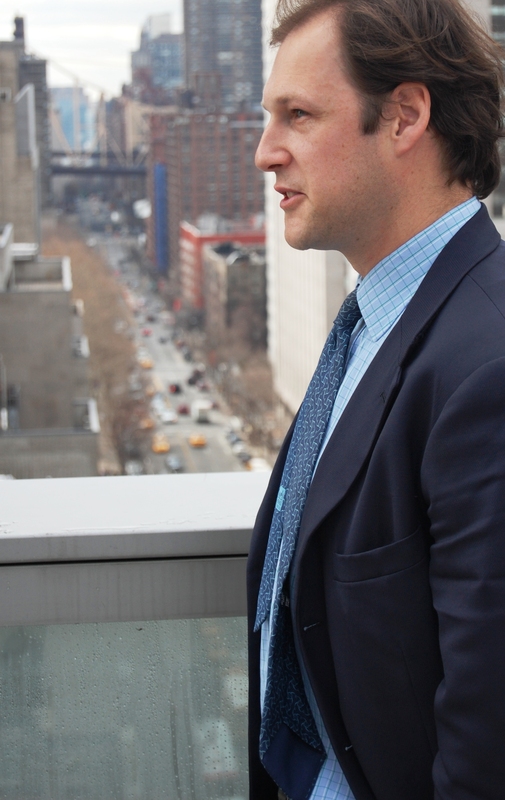 With Manhattan’s skyscrapers now in view, Francois is energized and puts his legs to work. He climbs and descends quickly, making a game of overtaking as many bicycles as possible – giving himself extra points if he overtakes a bicycle courier. At the foot of the Queensboro Bridge, Francois turns right on 1st Avenue. Despite busy traffic, Francois feels at ease. His commutes in New York – with its broad streets and designated cycling lanes – are easier than his commutes in London or Paris were, where streets were narrow and traffic was less fluid. Finally, Francois arrives at Sotheby’s headquarters on York Avenue. Currently, the building is filled with an exposition for early outer space artifacts. On his way to the shower, walking through Sotheby’s main hall, Francois passes Sputnik 2 – a space capsule Russia used in 1957 to send the first dog into orbit. The dog, Laika, didn’t survive the trip and died of overheating. Francois, still a bit heated from his game of overtaking cyclists, is happy he gets to cool off in the shower. 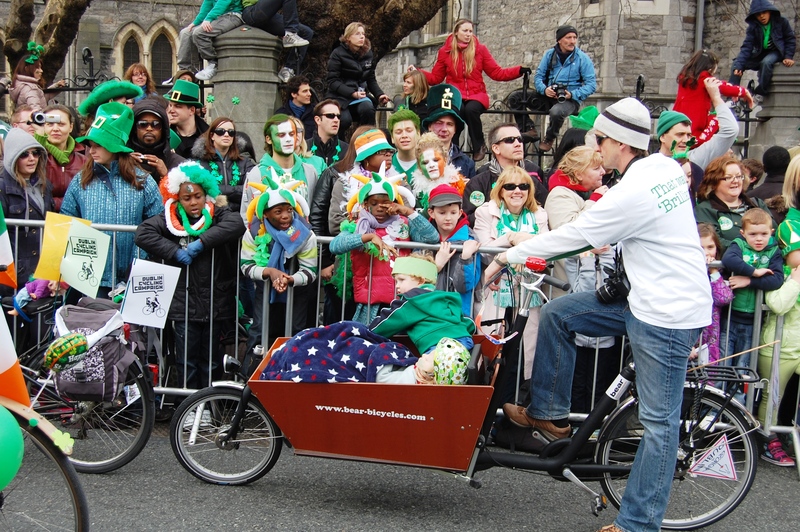 On St Patrick’s Day, we Dutch got a unique chance to be as Dublin as we can be. 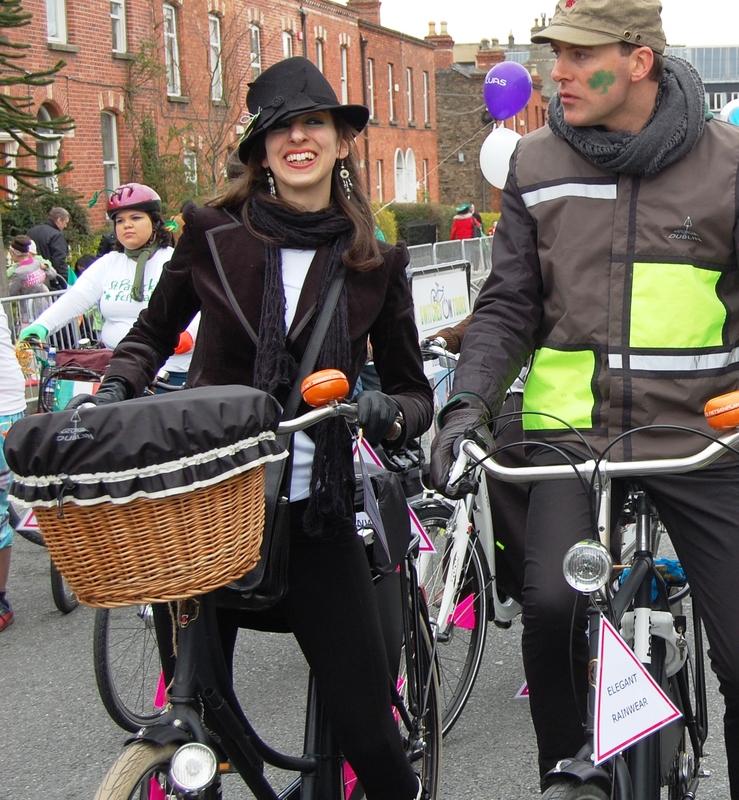 Because we’re into bicycles, we’re member of the Dublin Cycling Campaign. 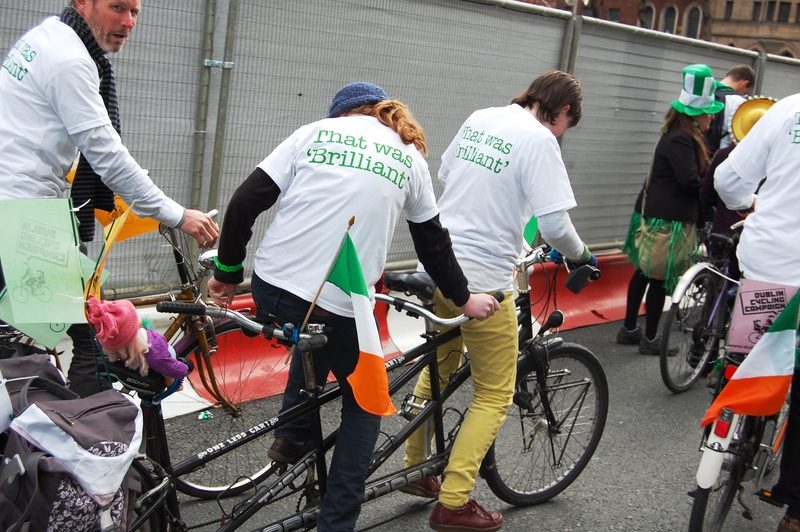 And because of that, we got to join in the last act of the official St Patrick’s Day parade: a host of Dublin cyclists, dressed in white green t-shirts with ‘That Was Brilliant’ written on the back. And indeed: it was brilliant. 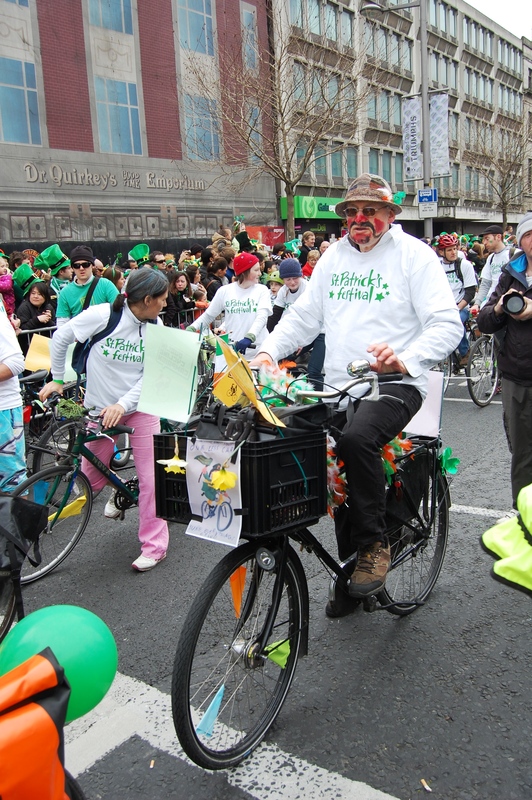 Together with forty other cyclists, we met on Dublin’s north side and from there slowly made our way through the city. I thought the purpose of parades was to amuse spectators: to let them clap, cheer, hug and sing — safe and anonymous from within a crowd. However, today I found out that there is actually more to see from a spot within the parade. From the inside, I saw the real attraction is the crowd itself – not the parade. It gave rise to a theory: rather than serving as entertainment for the spectators, parades may just be an elaborate way of attracting spectators, so that persons parading by have something to look at. Granted: the theory is far fetched, but it’s less unlikely when you consider what we saw, as we made our way through Dublin: children on shoulders, teenagers in lamp-posts, families on balconies, RTE helicopters and police on horses. 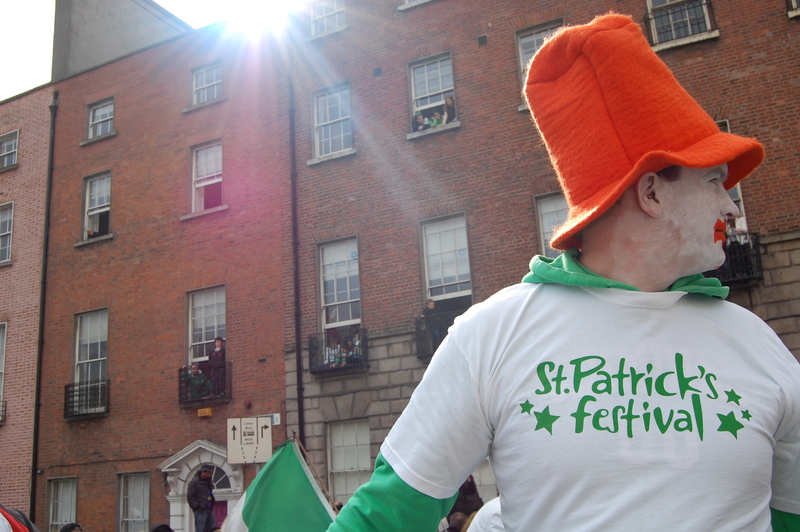 Moreover, we saw leprechauns behind bars, rugby teams with shamrock glasses, girls with face paint and viking helmets, musicians without instruments and drunkards making friends. The whole crowd seemed to work in concert, as if in an effort to perform a play for those lucky enough to walk undisturbed on the inside of the crowd barriers. Last week I was visiting friends in Groningen (a city in the north of The Netherlands). They recently had their second child, and their house had changed as a result; red, blue and yellow plastic building blocks were scattered across the parquet flooring and all electric sockets had been covered with children safety locks. 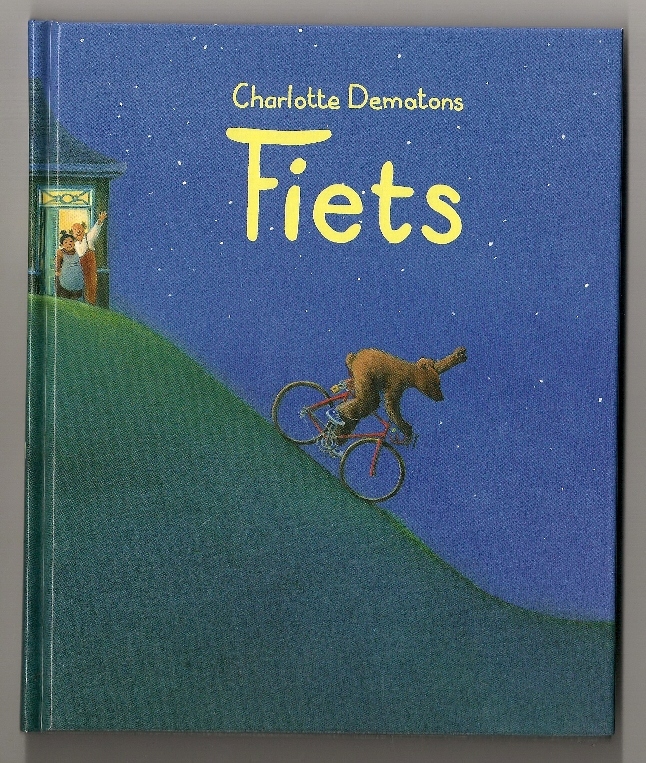 While my hosts were making coffee and changing nappies, I caught sight of a book called ‘Fiets’ by Charlotte Dematons, lying open on the side table. I read the book twice and was sorry to put it away when my host walked in with coffee. Later that day, I went to a book store and bought the book, partly because the main characters had won my heart, but more so because an unsolved mystery kept going through my head. No matter how many times I read the book, I could not find out where it took place. It seemed to be set in The Netherlands, and yet somewhere else. 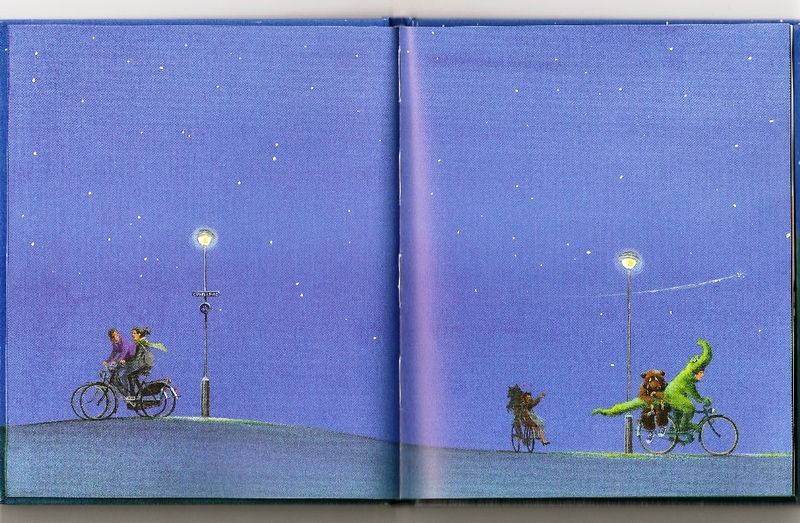 Since ‘Fiets’ is a wordless illustrated book, there are no clues in the text either. The story is about a teenager who lives in a country with countless bicycles – just like Holland. 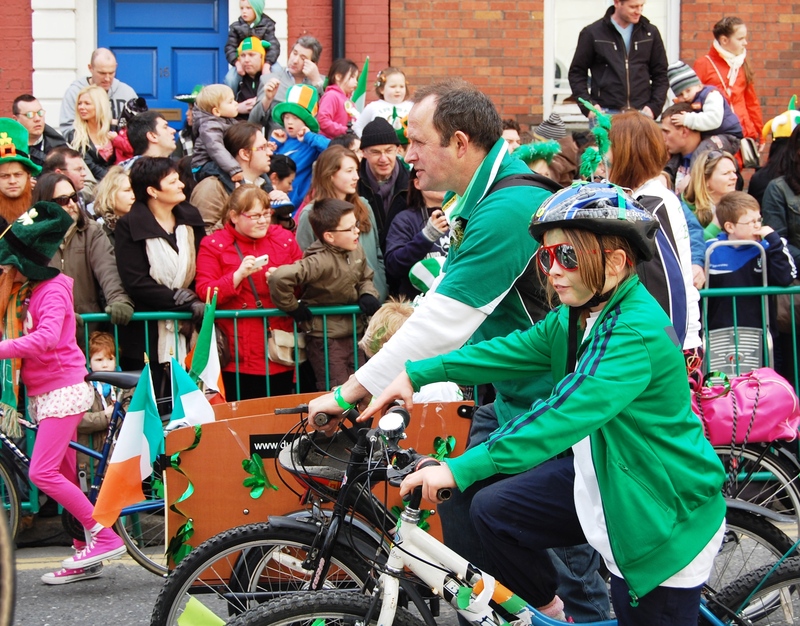 It begins with the teenager dressing up in a bear suit, and cycling towards a party – both typical Dutch things to do. He locks his bike to a lamp post, has fun at the party – which takes place in an avant garde gazebo with people in crocodile, monkey and unicorn suits – and returns to find his bike stolen; yet another Dutch scenario. The teenager is grief stricken, and gets a lift home from the crocodile. The next day, the teenager arrives at his school. He still hasn’t recovered from the loss of his bike and he loiters in front of the school, leaning into a traffic sign, crying. This attracts the attention of his classmates, who appear to be half his size – another indication the story is set in The Netherlands, since Dutch are generally quite tall. Also, the delivery bicycles, two seater bicycles, bikes with cargo boxes and grandma bicycles in front of the school are what you would find in front of a typical Dutch school. In other words, it seems this story cannot be set anywhere but in The Netherlands. But then, on page 19 or 21 – there are no page numbers, so this depends on where you start counting – the story switches to a place that has more undulation than the French Alps. 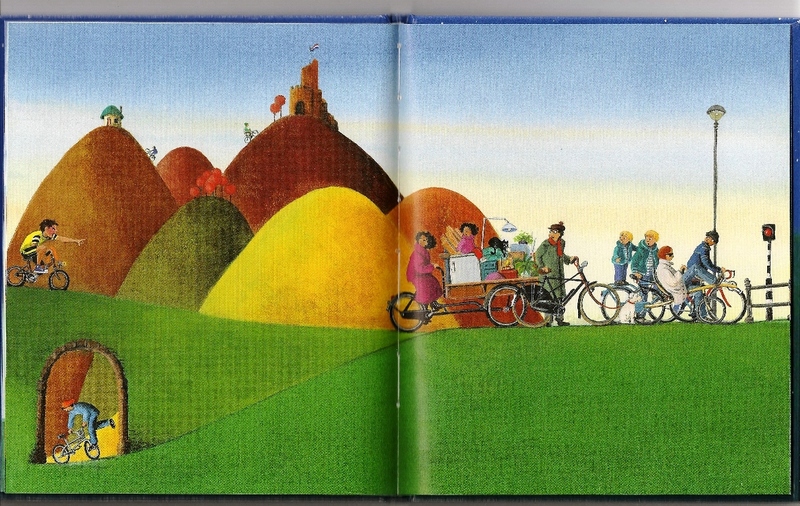 So in spite of the bear suit, partying, cycling, bike theft, tall people, and delivery bikes, the story cannot be set in The Netherlands – which is pancake flat. Even the castle on top of the hills, which sports a Dutch flag, can’t alter that. In the end, I am left to wonder about two things. First: if this beautiful place is not The Netherlands, then where is it? And second: if I can’t solve this mystery, how are the children of my friends in Groningen supposed to? 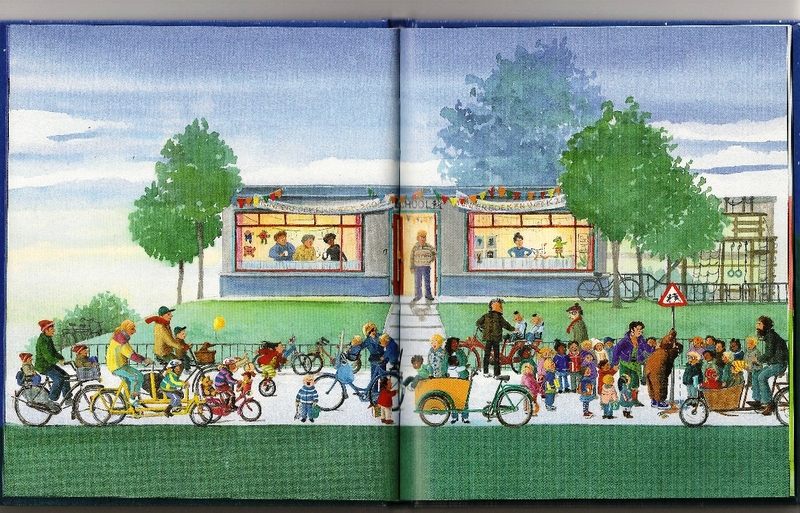 On the inside of the back flap of “Ride With Me, NYC“, there’s an aquarel painting of Manhattan. In it, smiling cyclists and yellow taxi’s ride alongside each other – in equal numbers. In the center of the painting, a tree with a face smiles up at the skyscrapers. To the right, a girl with a pink hat and a take away coffee – her back towards us – overlooks the scene. 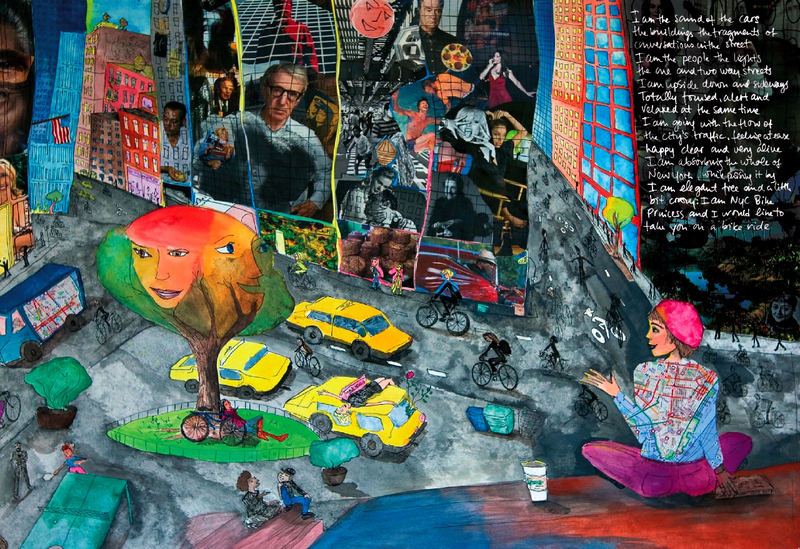 Above the girl’s head, someone with high school handwriting has written: ‘I am elegant free and a little bit crazy: I am a NYC Bike Princess and I would like to take you on a ride’. The back flap painting is artwork by Roos Stallinga. 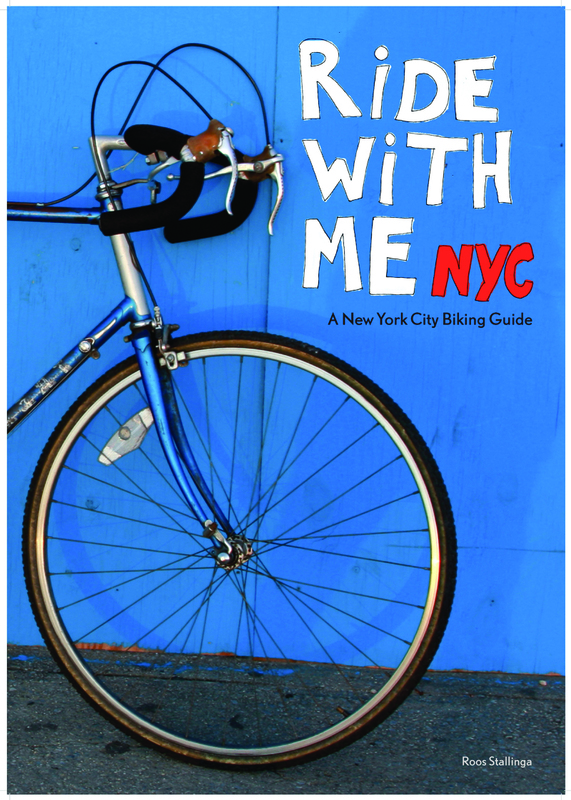 Roos is also the author, photographer, illustrator and publisher of Ride With Me NYC; a book with cycling routes, inside stories, and scenic highlights of New York. Roos was initially inspired to write the book by her student days at New York University. 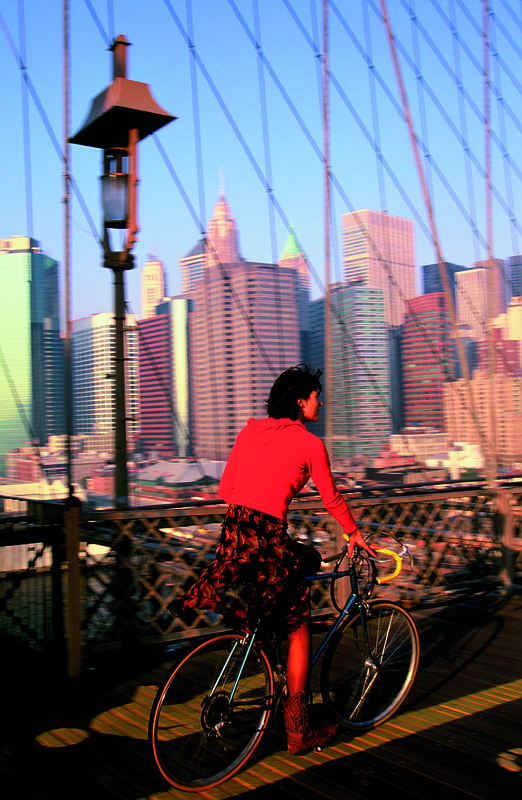 In New York, Roos continued her Dutch habit of cycling everywhere. Soon, fellow students would know Roos was close if they spotted her blue Panasonic racing bike locked against Washington Square’s gates. However, the idea to write a book really took hold of Roos after the numerous visits from her Dutch friends. Roos always took those Dutch friends on cycling tours from West Manhattan, through Chelsea, over the Brooklyn Bridge into Brooklyn, and finally back to Manhattan via the Manhattan Bridge. Those trips would last a full day; with frequent stops for coffee, sandwiches and conversations. Roos would time the return trip to Manhattan to coincide with sunset, so that her friends could take pictures of the skyline from the foot of the Manhattan Bridge. While they were taking pictures, food smells would drift up from Chinatown below – promising a deserved dinner after a day of cycling. Ride With Me NYC makes you feel as if you are visiting Roos yourself. 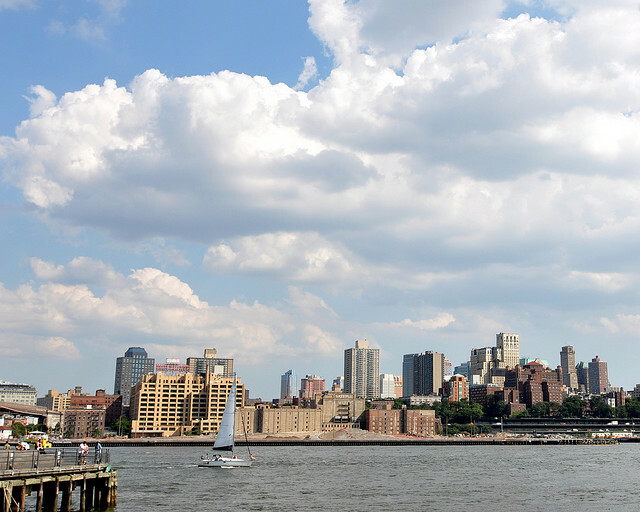 It sets out 10 cycling trips that take you through Manhattan, Brooklyn, the Bronx, Queens and Coney Island. The routes have been marked with a ball point pen on old-fashioned maps, and Roos gives a personal introduction to each trip. For the trip to Red Hook – for example – she writes: “Biking to Red Hook feels (…) like biking to the end of the world. This section of Brooklyn was once a little Dutch town called Roode Hoek, or Red Corner (…)”. Roos has interviewed locals, and lets them recommend stops on the way. The stops on the DUMBO to Bushwick route, for example, are tips from Molly Surno – a Brooklyn photographer and curator of Cinema Sixteen who appears to know every vintage dealer and weekend market on the east side of the Brooklyn Bridge. If you never intend to actually cycle through New York yourself, this is the closest you will get. Roos is currently working on her next book: a cycling guide for Amsterdam. Having asked her if Amsterdam isn’t a crowded arena for a cycling guide, Roos draws the bigger picture: hers will not be a guide for tourists, nor will it merely be a cycling guide. Like her book on New York, her Amsterdam guide will focus on real Amsterdam life. No routes with Rembrandt or Windmill themes, but routes that touch the whole spectrum of life in Amsterdam: with tips on cheese, herring, and cafe’s for borrels and bitterballen. Furthermore, her art work and stories will make the book worth reading even if you don’t want to cycle. In other words: the Amsterdam guide could just as well sell in New York. After all: didn’t I just buy her New York guide in Amsterdam?